ProTouch Pool Services cleans a Tierrasanta swimming pool on a weekly basis. 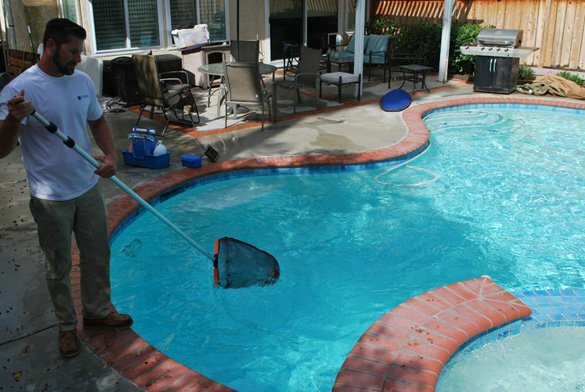 Our weekly pool service includes vacuuming, balancing the water and cleaning the tile. We also net the pool water surface and empty the pump baskets. 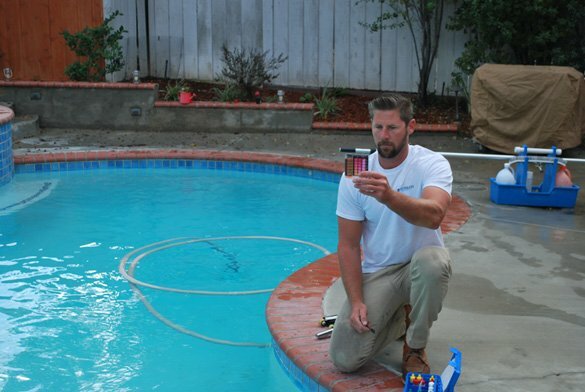 Every maintenance stop our pool service tech looks at the pool equipment. Therefore the homeowner can be notified of any problems. The kidney shaped pool also has an attached spa. Along with cleaning the swimming pool we also clean the spa every week. An automatic pool vacuum is in the pool. It helps keep the pool floor clean but we still vac the pool each service stop. The pool and spa have blue tile and brick coping stones. Surrounding most of the pool is a concrete deck. A small raised bond beam with a planter bed is on one section. The pool equipment consists of a heater, controller, pump and filter. 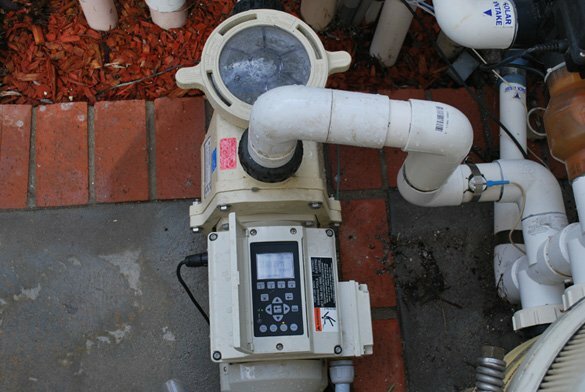 A Pentair EasyTouch automated controller is attached to a high efficient smart pump. The Intelliflo circulation pump helps to keep pool energy costs down. Heating the spa and pool is a Raypak 406A heater. We make sure the pool equipment runs properly. 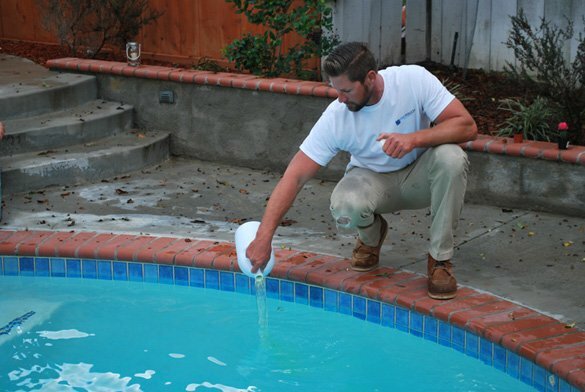 This includes cleaning the pool filter when it is dirty and replacing broken pump baskets when needed. 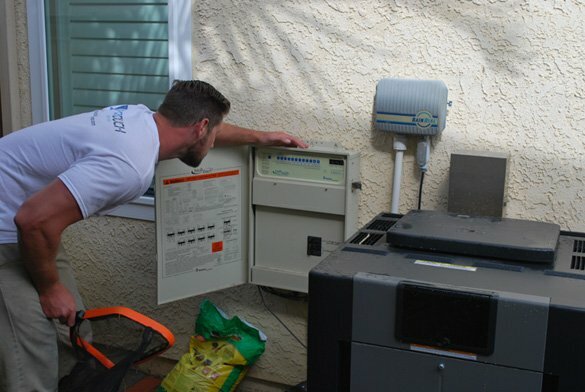 ProTouch also repairs our customers pool equipment when they break. Upgrades and adding automation can also be completed whenever it is called for. 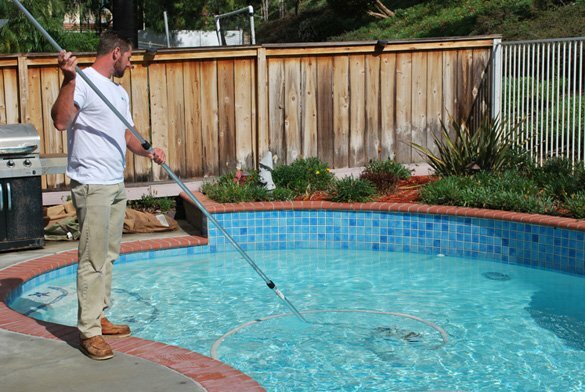 As with our other San Diego pool service customers we provide a vast array of services and products. When following this weekly pool service routine, we ensure that the service standard is the same week after week.